FAQ: What tank would be best for rainwater harvesting at a camping site? The customer needed a rainwater harvesting tank for camping site that was located on a mountain top. Collapsible tanks were offered as a solution for their low costs and easy transportation. Question: I want to build a campsite on top of a 1000ft mountain that is hard to climb. The area has a rainfall of about 700 mm per year. I want a system to catch rain water on top of the mountain to provide campers with water for washing. As everything has to be physically carried up the mountain, I'm thinking of a portable water tank and a way to catch the water. The rainy season is from November to March and I need to store water from April to November. I think I'll need to store a total of 10,000 liters. If you have a solution, where can I buy if I live in Namibia? Answer: Thank you for contacting us at Portable Tanks, a division of GEI Works. There are a couple of different options you could consider for that type of rainwater storage and collection. Since you require something with easy mobility, the best option to consider might be one of our Rainwater Harvesting Tanks for your camping site. 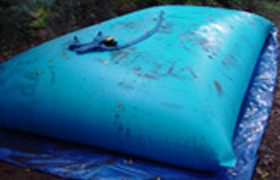 A rainwater collapsible tank, also known as a water bladder, pillow tank or flexible tank, is an extremely flexible unit that has been used for the storage of drinking water, rainwater, gray water and various other liquids. Because they are designed specifically to be flexible, the collapsible tank arrives to your location flat and folded. When compared to other tank styles and fabrics, this can offer huge advantages in terms of transportation. Tanks will not require large machinery or equipment, but can be placed in vehicles or carried to your desired mountaintop location. In addition to easy transportation up your mountain, these tanks will also provide economical shipping to your location. Since a majority of our tanks are manufactured in the United States, having a flexible tank that is folded up and placed in a box can greatly reduce shipping costs. Your rainwater harvesting tank for camping site can be built in almost any capacity from 1 to 210,000 gallons, including a unit that is 10,000 liters in size. Depending on the fabric you choose, tanks will typically be made to an approximate filled size of 15 feet in length by 11 feet in width by 2.1 feet in height. We ship internationally, so you wouldn't even need to look in Namibia! We will contact you shortly to discuss this possible solution for you.